Hi! I'm Lisa, the author of this blog. Thank you for visiting! For me, baking is a hobby, but it's also a way to enjoy the simple pleasures in life and connect with others by sharing treats. Although I have never been a professional pastry chef, I have completed a one-year pâtisserie certificate program at Le Cordon Bleu in Paris. I learned how to create classic French pastries, everything from eclairs and croissants to fancy layer cakes and chocolates. I also discovered the Parisian sense of joie de vivre found in almost every Parisian boulangerie and pâtisserie shop. 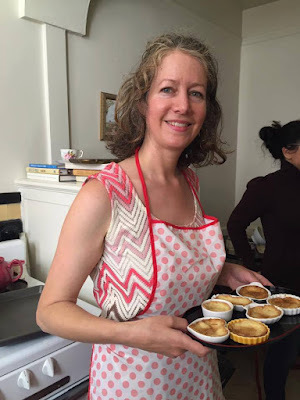 I hope this blog will inspire many memorable baking experiences and special occasions celebrated with delicious desserts! Copyright © 2013 - 2018, Lisa Alexander. All rights reserved. I love your *sweet* new blog, Lisa! Keep 'em coming. It will be fun sampling these delicious-sounding recipes! Thanks for sharing them Lisa and these helpful reviews. I look forward to more! Thanks, Heidi! I'm looking forward to getting together for tea and sharing some of these desserts with you! Lisa, What fun to have stumbled upon your blog! Are you still writing? The graphics are fun, too! Look forward to learning more about your sweets!